Bis zu 50% der Nahrungsmittel verrotten in den Ländern des Südens weil sie nicht konserviert werden können. Das direkte Trocknen in der Sonne beeinträchtigt die Qualität des Produkts durch Staub und Tiere. Und durch einen Regenschauer kann die ganze Ernte kaputt gehen. Durch das Trocknen werden die Geschmacksstoffe mancher Obstarten intensiviert und enthalten danach konzentriert die Nährstoffe, werden süßer und schmecken gehaltvoller. Die Vitamine und Mineralstoffe bleiben weitgehend erhalten. Nur Vitamin C. wird abgebaut. Selbst getrocknetes Obst und Gemüse ist frei von Konservierungsstoffen. Solare Trockner sind eine gute Lösung nur leider viel zu wenig verbreitet. Solch ein Trockner kann in einem Tag gebaut werden für weniger als 70 $! Diesen Trockner habe wir in Ecuador mit Indigenas gebaut, in 1 Tag, Kosten: 70 Dollar! Ein Solarpanel bietet sich an als Regelung für den Lüfter. Nur leider macht so ein Solarpanel die Anlage recht teuer und wird auch gerne gestohlen. Eine andere Möglichkeit ist ein einstellbares Steckernetzteil. Damit ist es möglich manuell die Geschwindigkeit des Lüfters zu verstellen. Oder hier eine elektronische Temperaturregelung wenn Strom zur Verfügung steht. 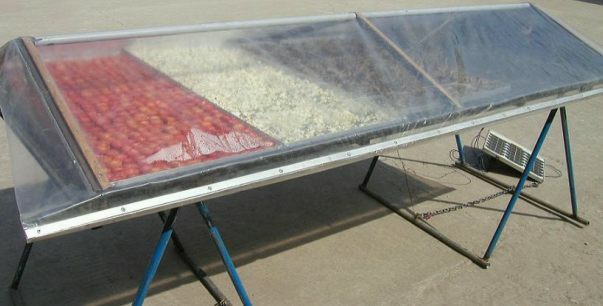 Temperature-controlled regulation of a Fan for food drying. 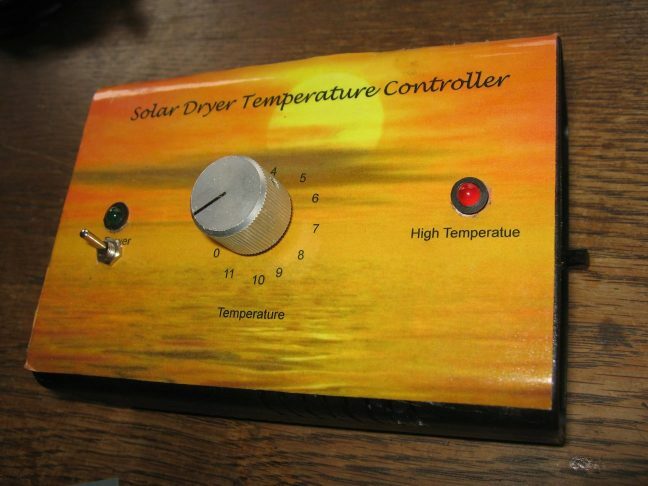 Programmable Time for to have a higher Temperature at the beginning of Drying. 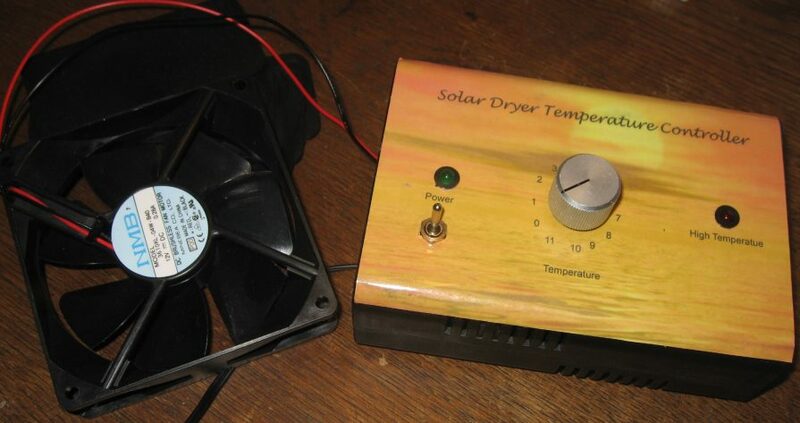 Programmable Time for to have a higher Temperature at the End of Drying. Optionally switch on and off of a Heater temperature-controlled to be independent from critical weather conditions or to dry also at night. 12V, 24V and optionally 220V Fans can be connected. Up to 15 Amperes Charging Power using POWER-MOFET-Transistors. Overcharging-Protection of the Battery by fast Pulse-Wide-Modulation. This Mode gives better charging-results than slow Pulse-charging. Boost-charging from time to time (depending from the discharging level or at least once a month). Boost-charging avoids the degeneration of Liquid-Batteries. 80 % of the Batterys die from a degeneration of the Battery-Plates. Due to research-work of the University of Vienna, Austria and NASA, USA, this degeneration can be reduced drastically by very short High Current Pulses to the Battery. This charge controller is equipped with this feature, to extend life-time of the Battery. Applicable for 12V or 24V-Systems. The System-Voltage is verified automatically. If you use the Relays, you have to order a 12V or 24V-Version. One Major Problem of Solar-Systems is the stealing of the Panels or of the Food in the Dryer. This Device is shipped with a Theft-protection. One channel can be switched on by a Moving-Detector or a Switch or a Push-Button. The Delay-off Time can be programmed. With that you optimize your Energy-demand by switching off Devices Automatic if not needed. 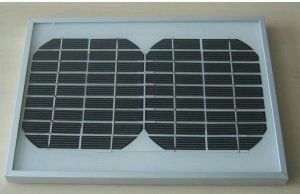 With an external Circuit: A high voltage is activated at the Panels-Frame as soon as somebody is coming close to the Panels. If somebody touches the Solar-Panels, he gets an electrical shock. Of course the voltage can not hurt anybody. Optional: One short-circuit-protected Voltage Output with a fixed voltage of 5 V or any other if needed. For to connect small Radios or TV directly to the Unit. 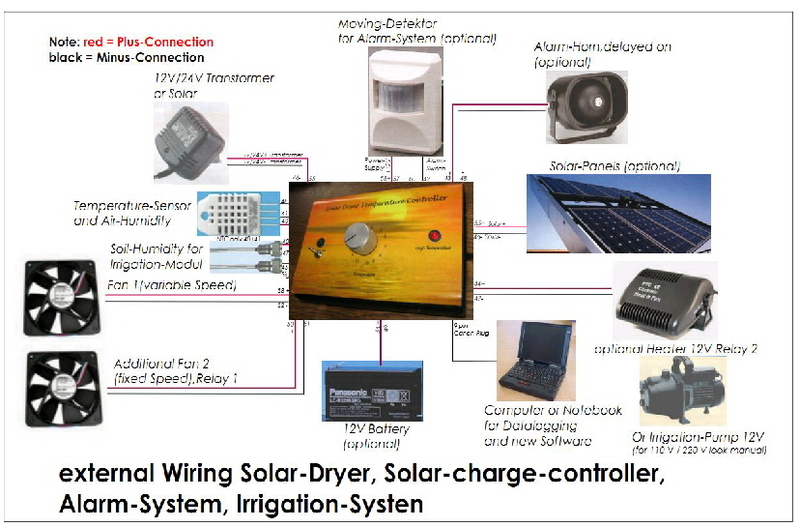 By a Program-Switch many Functions like Dryer-Temperature, Battery-Type etc. can be programmed. You can also activate a Simulation-Mode for the Battery-Voltage. Easy update of new Software by a small Program and the Data-Cable.